Bunratty Castle welcomes you to a medieval banquet! Photo courtesy Shelly Kirwin. The crackle of the grand fireplace, the slosh of wine pouring into a goblet, the glow of candles, the smell of fresh food wafting around the stone hall. 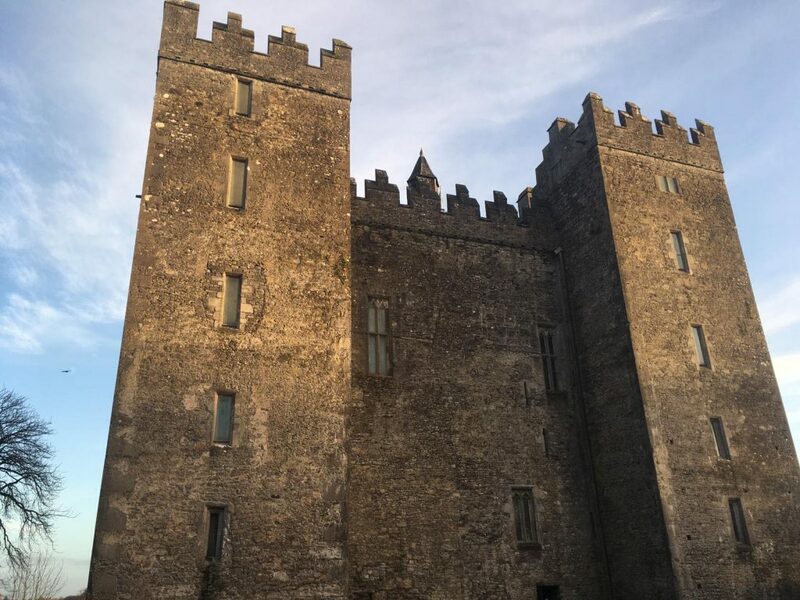 The Bunratty Castle Medieval Banquet is one of the most immersive experiences you could ask for. Hi everyone, I’m Paul Anthony Shortt, fantasy author and YouTuber. For my entry into the Dublin 2019 Touring Tuesdays Blog, I wanted to harken back to an experience I had several years ago, which I’ll never forget. The Castle. Photo by Shelly Kirwin. Several years ago, I brought my wife, Jen, on a trip to Bunratty for her birthday. Home of Bunratty Mead and close to Limerick and Ennis, Bunratty is a lovely area with beautiful countryside. It’s also home to an attraction we’d been wanting to experience for years. 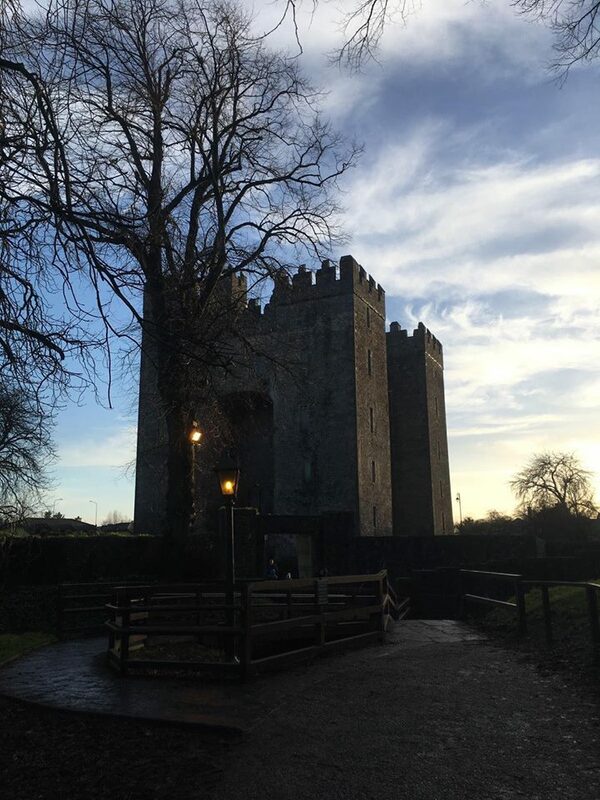 Bunratty Castle is a 15th Century tower house in Co. Clare. Shannon Heritage host banquets here, in full medieval style. Tickets have to be booked in advance, but it’s well worth the time if you can go. The evening begins as you make your way up the wooden steps, to the sound of a piper playing. There is no wheelchair access, unfortunately, which made things tricky for Jen, but she made her way up with her crutches and staff were happy to keep her wheelchair safe for us. This leads you to the main level of the castle, where you’ll sit for your meal. Medieval Banquet musicians. Photo by Doug Kerr under Creative Commons. But where the night really gets going is when the banquet itself begins. Seated at long benches in the main hall, you can feel the banter and atmosphere rise. Then the Earl of Thomond appears on a balcony above and greets you as his guests. 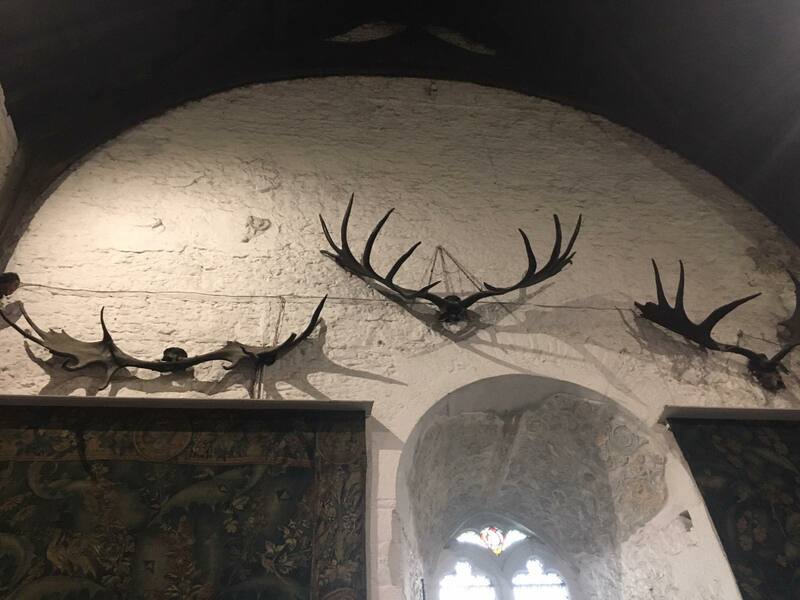 Deer antlers adorn the walls of the great hall. Photo by Shelly Kirwin. The first course is soup, but there is no spoon. You must drink by lifting the bowl and slurping, mopping up the rest with fresh bread served on wooden boards. Between courses you are entertained by singers and musicians, and clay jugs are brought out to refill your wine throughout the night. 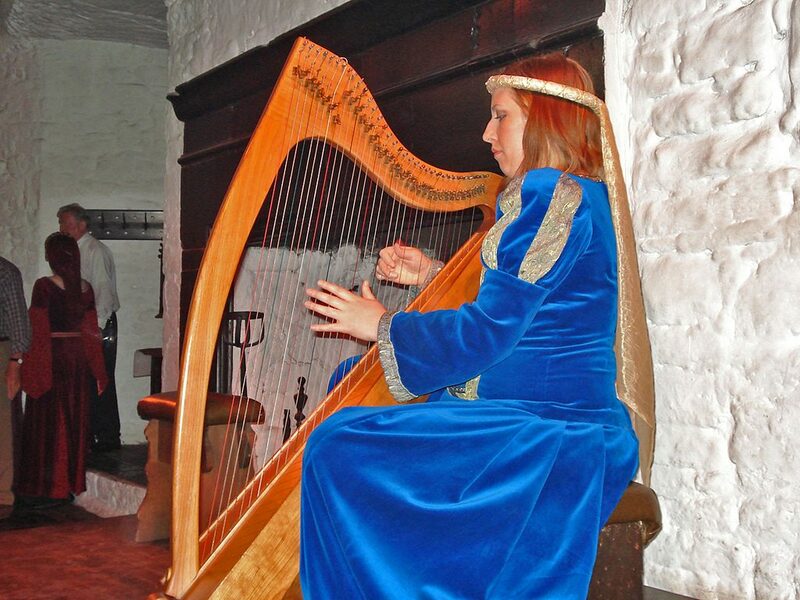 Musician at Bunratty Castle Banquet. Photo by Carole Waller under Creative Commons. Next is a course of ribs, and you’re left to use your dagger (a wood-handled serrated knife) to cut your food and eat by hand. Historically-accurate or not, it evokes an intoxicating atmosphere that only the most cynical could resist. Before the main course, it is revealed that someone among the guests is a traitor, and is revealed to the Earl. They are swiftly locked behind a cage door until the Earl can decide a fitting fate. Which, usually, turns out to be singing a song or telling a joke. The traitor dealt with, it’s time for pain-fried chicken on the bone and a selection of vegetables, again eaten with just your dagger. I should mention that vegetarian options are available for all courses, and the commitment to customer experience is stellar. 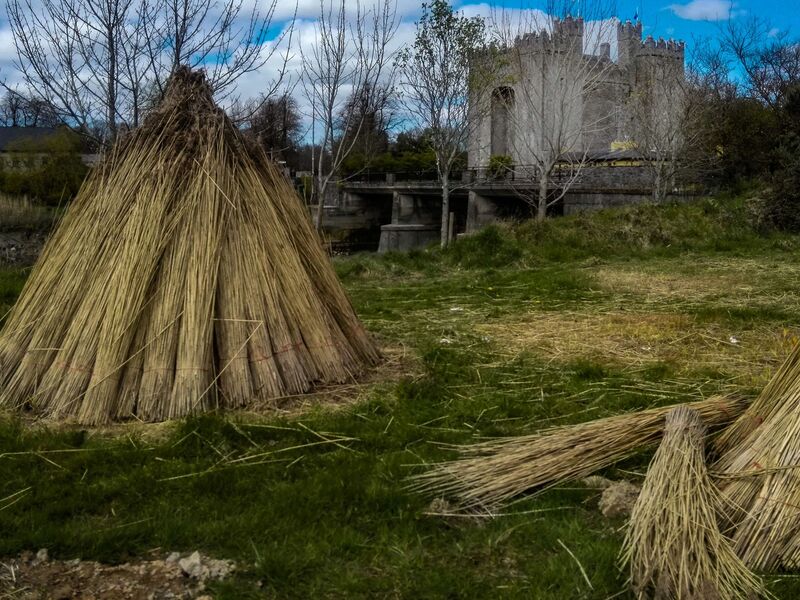 In the grounds of of Bunratty Castle lies a very fine folk park where many activities such as thatching are demonstrated. Photo by Kevin Clancy. The night ends with desert and tea or coffee. Despite the heavy element of performance and the structure of the evening, nothing ever feels rushed or forced. 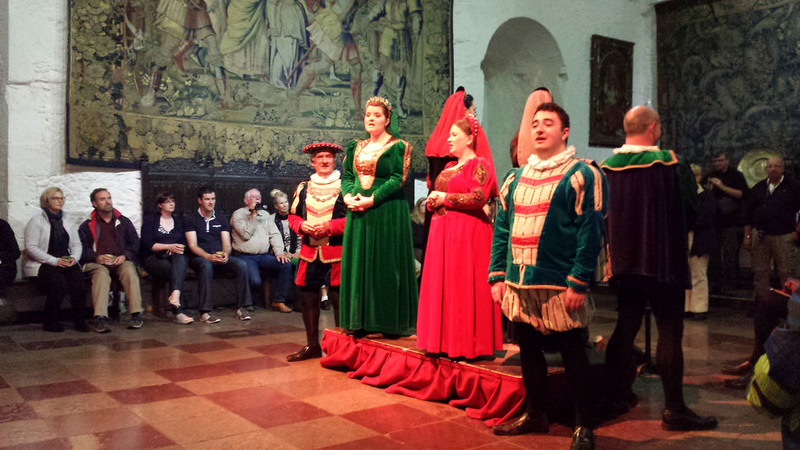 The staff fit their roles so naturally that, sitting under wooden rafters and surrounded by stone walls decorated with tapestries, you could be forgiven for feeling like you’d been pulled into another time. It’s not a night for everyone, of course. I can easily imagine some might have issues with how the food is to be eaten and the obvious difficulty for the mobility-impaired. And anyone suffering from social anxiety might have a problem if they’re selected as the traitor. But if my own experience is anything to judge by, if there is a way that the staff can help you enjoy the banquet, they will do their utmost to make it happen. If you’re looking for a unique activity and some fond memories, this is heartily recommended. 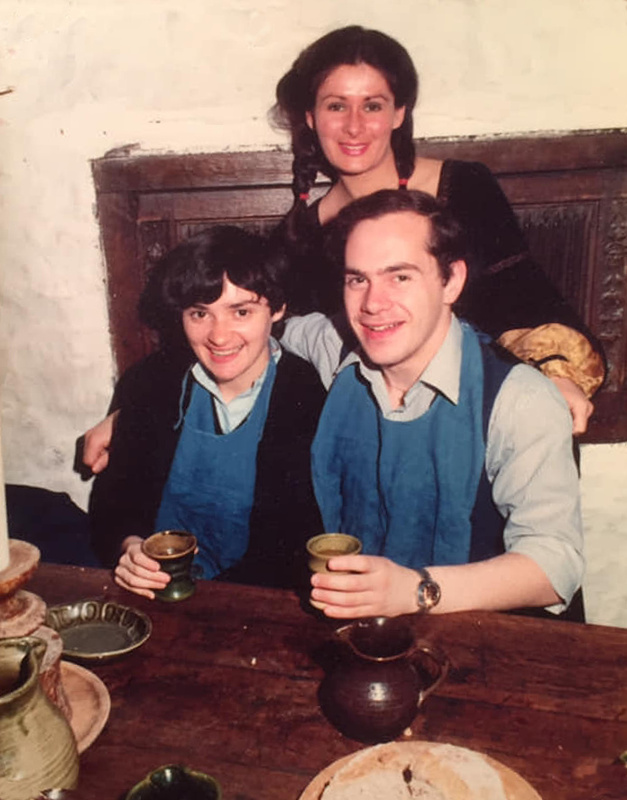 Another Dublin 2019 volunteer, Peter McClean and his wife met at the Bunratty Castle banquet way back in 1980. Paul Anthony Shortt has been writing since he was a teen, starting with attempts at horror, then discovering urban fantasy as an adult. His first series, The Memory Wars Trilogy, began in 2012 and in 2014 he dabbled in steampunk fantasy with Lady Raven. The final book in this series, The White Raven, will be released this winter. He is presently working on two dark urban fantasy series and hosts a YouTube channel called Epic Storytelling. He can also be found on Twitter. Progress Report 2 is out! “World Science Fiction Society”, “WSFS”, “World Science Fiction Convention”, “Worldcon”, “NASFiC” “Hugo Award”, the Hugo Award Logo, and the distinctive design of the Hugo Award Trophy Rocket are service marks of the World Science Fiction Society, an unincorporated literary society.